Pedersen Group handles over 8.3 million tonnes per annum of wood fibre across its operations, in the form of logs, wood chip and hog fuel. The company employs 140 people across Australia and New Zealand and has an existing joint venture with C3 Limited, which provides wood yard management services to customers. LINX Cargo Care Group has entered into the purchase agreement with Pedersen Group which is expected to be completed mid-August. Pedersen Group CEO Gavin Hudson said the conditional agreement reached this week will provide the Pedersen Group with an aligned and committed long-term owner, which will enable Pedersen Group to continue to focus on providing critical services to its customers. “We are delighted to finalise this agreement with LINX Cargo Care Group. The acquisition of Pedersen Group by LINX Cargo Care Group will provide long-term stability for our employees and customers, and the operational and financial capacity to allow our business to pursue its growth aspirations,” Mr Hudson said. Anthony Jones, Group CEO for LINX Cargo Care Group and Chairman of C3 Limited said the acquisition of Pedersen Group brings a complementary service offering to customers, including a highly skilled workforce that specialises in wood chipping and wood yard management. 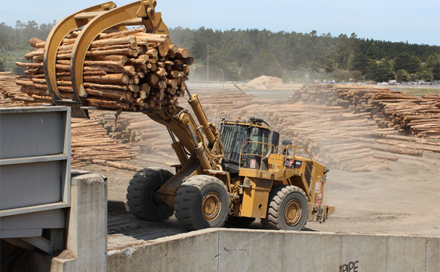 “LINX, C3 and Pedersen share a long and rich history in the forestry industry. Our combined expertise and experience will provide an enhanced customer offering, further access to capital, and the opportunity to collaborate and collectively grow into the future,” he said. “We are very excited to welcome Pedersen Group to LINX Cargo Care’s group of companies. Pedersen’s will enable our organisation to grow its services to forest owners and wood processing businesses. “In addition, Pedersen’s capabilities and services complement C3’s existing customer offering and will extend our reach to a customer base in diversified global markets. “The synergies and strategic alignment between Pedersen’s and C3’s forestry business is significant. Importantly, our company values are closely aligned, and we very much look forward to welcoming Pedersen’s talented and highly skilled workforce to the team,” Mr Jones said. Pedersen Group will continue to operate independently under the Pedersen brand following the completion of the acquisition, and all Pedersen employees will be retained by the new owner.